Yesterday’s blog about giant mistletoes featured the amazing Western Australian Christmas Tree – a mistletoe that grows in the ground by parasitising the host’s roots, not the branches. And today another Australian mistletoe story caught my eye – though this time because there’s a bit of mistletoe misunderstanding in it. It’s the first of these (mistletoe misunderstandings) I’ve featured for the 2013 season, though it probably won’t be the last, judging by previous years! So what was the mistletoe misinformation? Well, clearly Councillor Kolkman doesn’t know much about plants! He suggested the parasitic nature of the local mistletoe makes it unlike the festive variety (when actually it makes it exactly like it!). And then goes on to claim that it is spread by ‘spores’ that are ‘carried on the wind’ and so could infect the whole neighbourhood very quickly. But, most mistletoe seeds (not spores, mistletoe is a highly evolved higher plant and most definitely grows from seeds!) are spread by birds. Which means spread can be to the whole neighbourhood, but it will be one seed at a time and therefore won’t be rapid. Australia even has a special Mistletoe Bird. What does he think this does with mistletoe? Kiss under it? 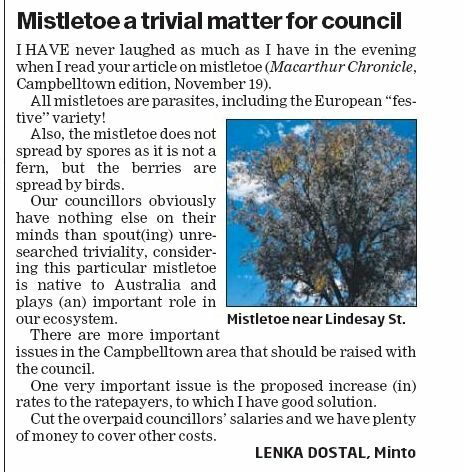 But, to be fair to Councillor Kolkman, he may be right that local mistletoe needs control (though probably only in urban areas, not in the wider environment where it will be an important part of the ecosystem). But he doesn’t help his case with scaremongering lines about wind-blown spores! In the 26th Nov issue of the newspaper there is a letter responding to his concerns. The letter writer, Lenka Dostal, says “I have never laughed as much as I have in the evening when I read your article on mistletoe” before going on to describe Kolkman’s errors. But it can’t have helped. And we Jonathans have to stick together*!! So I have a mistletoe-themed proposal to help sort the whole sledging problem once and for all. The next stage of the series, the 2nd Test, will start at Adelaide on 5th December. And what’s Adelaide famous for? Mistletoe! Well, it should be famous for it. There was last year’s announcement from the University of Adelaide about their research on mistletoe in cancer therapy – but that was using European mistletoe extracts and that’s not what I’m thinking of. In mistletoe circles the area is best-known for its mistletoe conservation/management work – particularly with Box Mistletoe (Amyema miquelii). 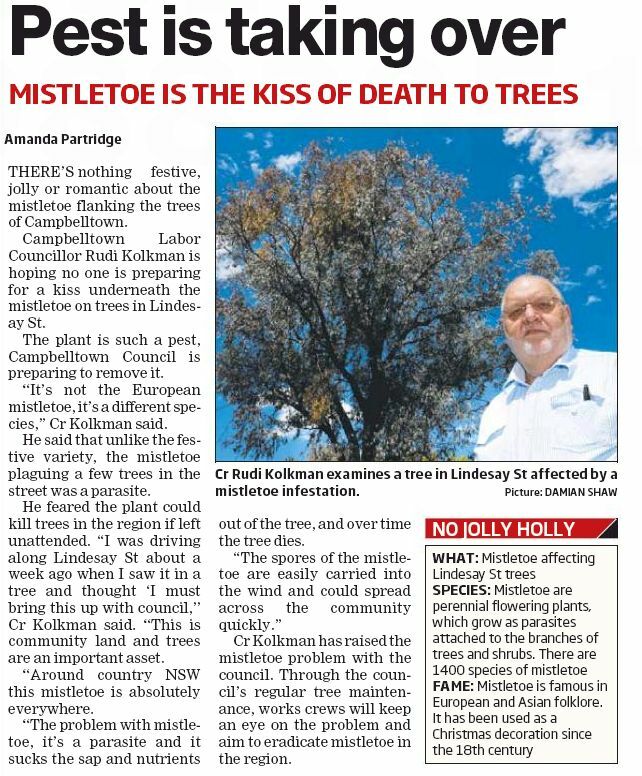 They even have a Mistletoe Action Group in the Clare and Gilbert Valleys area. Don’t believe me? Read this. Maybe I’ll drop a line to Aggers (another Jonathan) to see what he thinks. *Except for, obviously, the bounder Aitken. 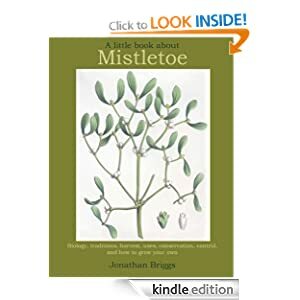 Try The English Mistletoe Shop for Grow-Kits, Grow-Kit Gift Cards, Books etc, and mistletoe of course. What is the largest mistletoe in the world? Who has the largest mistletoe? The Mission Inn Hotel & Spa in California thinks it does. 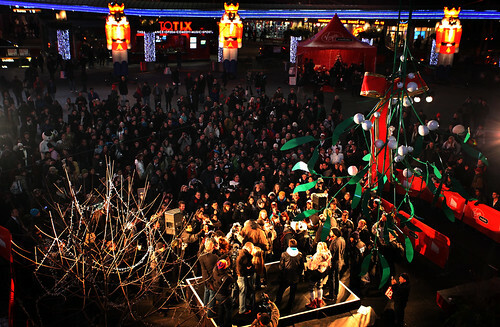 They even claim that the 12-foot-long by eight-foot-wide mistletoe (pictured right) hanging from their entrance is recognised in the Guinness of Records as the world’s largest. And they should know something about large there – apparently the hotel occupies an entire city block. And they’ve had that giant mistletoe for 2 years now. But lots of other places have claimed to have giant and largest mistletoe in recent years. I’ve covered a few in this blog over the years – including the giant steel mistletoe at RHS Harlow Carr Gardens in 2008 and the giant mistletoe that hung at Heathrow Terminal 5 in 2009 (pic on left). There’s a video of that one at the bottom of this blog entry. And that’s just a few. Some of them may even be the same giant mistletoe, just doing the rounds of big corporate marketing departments. But there’s something wrong with all these giant mistletoes – and you’ve probably guessed it already. The clue is in the wording given by the Mission Inn Hotel – who say it is “the world’s largest man-made mistletoe”. You can’t have a ‘man-made mistletoe’ – you can only have a man-made model of some mistletoe…. They’re not actual mistletoe! Of course not – they’re just bits of plastic and metal dreamt up by marketing teams. They’re not really about botanical traditions – but everything to do with (rather naff) commerce. Does this matter? Well yes, it does, or should do. 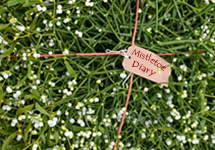 Kissing under mistletoe is a custom celebrating the peculiarity and properties of the plant – and so kissing under a bolted together collection of green and white painted hardware is insulting that tradition, and the plant. Maybe there is a real largest mistletoe out there somewhere? Many mistletoe species do grow quite large – our own Viscum album species can reach several feet across, maybe a metre or two total for large plants. But it, like most other mistletoes, is usually limited by strength or health of the host branch, with that branch eventually falling or failing. Often it doesn’t get to that stage, as the mistletoe itself is fragile with chunks of growth breaking off in high winds, which perhaps provides a sort of fail-safe mechanism for both mistletoe and host branch. So could a real mistletoe get very large if it wasn’t growing on a branch? Maybe. And are there any that don’t grow on branches? Yes! A few mistletoes develop from the host root system – so they actually look as they grow out of the ground, like a conventional plant. Do these grow large? Well, they are known as the Tree Mistletoes. so, yes, fairly large. 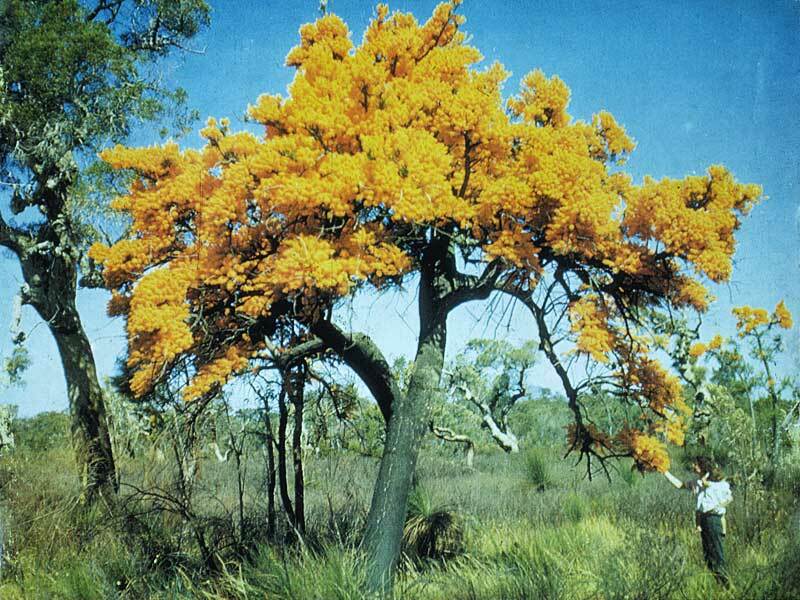 So, my nomination for the largest mistletoe, and the one with the best name for Christmas, is Nuytsia floribunda, It is so big you don’t even have to hang it up – just walk under it. And I reckon it puts all those promotional giant plastic and metal monstrosities in the shade. They’re just pendants (and I’m just a pedant). 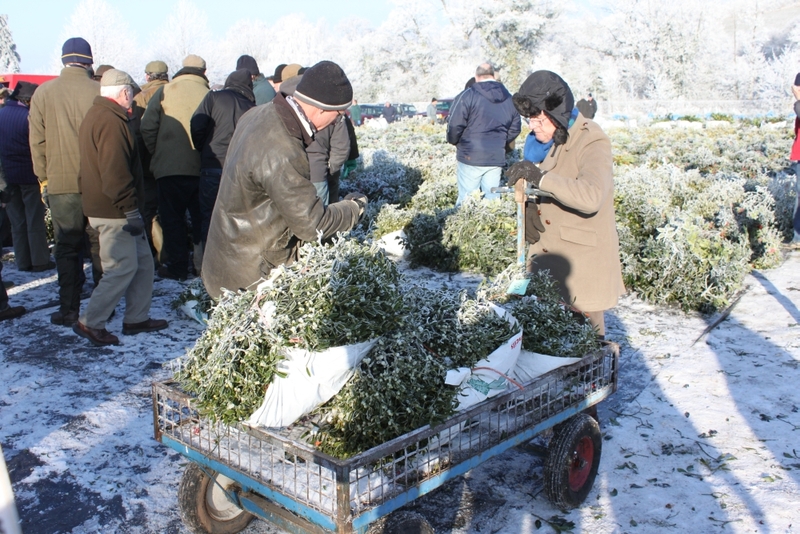 This week sees the first wholesale mistletoe sales in Tenbury Wells, and so it’s about time I started posting more regularly in the Mistletoe Diary. Texas – home of much of the Christmas mistletoe used in the USA – but is there or is there not a shortage? Starting soon, though not necessarily in the order above, so do keep watching…. Looking for unusual mistletoe-themed presents this Christmas? Another day, another mistletoe inspection. And this year’s berries are looking better every time – all fully-formed, and full-sized and lots of them. Yet another mistletoe bling year looms, but this time with perfect berries. 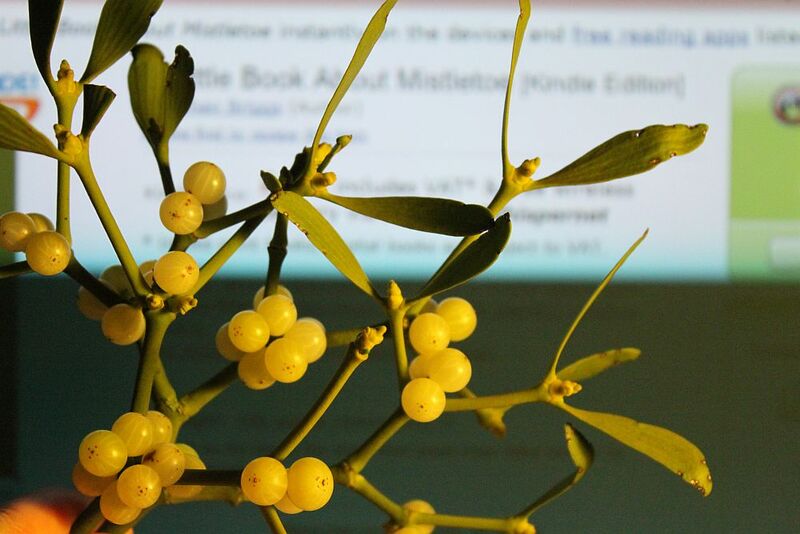 And I think it’s berry impressive that I’ve finally (yesterday), after 2 seasons of talking about it, formatted A Little Book About Mistletoe for Kindles and Kindle Apps. It looks particularly good (I think) on colour kindles, though it is also perfectly presentable on the black’n’white versions too. In the last week or two there has been some worrying about how late mistletoe berries are whitening up this year – staying a milky-green for too long. But I was out looking at mistletoe yesterday and found lots of almost entirely white berries, so I don’t think we need to worry. Much depends on which side of the tree you’re standing – on the south-facing, sunny side of the tree, all the mistletoe now has almost-white berries, whilst on the north-facing, shaded side of the tree, the mistletoe still has green ones. Berries on any plants in the middle of the tree are often green too. Perhaps part of the problem, if there is one, is that some host trees held their leaves longer this year, extending shade longer than normal. But the wind and rain of the last week or so have taken off many of those last few host leaves and so that problem has gone (or is going rapidly). Nothing to stop full ripening now.